Reason 8. Human activities are influencing landscape dynamics. Increasingly, many geomorphological processes and landform/landscape developments are influenced by human activities. Across Wales, human activities influence geomorphological processes, landforms and landscapes, both indirectly and directly. Indirect influences include human-induced changes to animal populations or vegetation covers that may have an influence on hillslope runoff and sediment transfer, such as badger control programmes (Reason 2), afforestation or woodland felling. Direct influences include deliberate manipulation of geomorphological processes, and can either enhance natural rates of change, such as by promoting river meander cutoffs as part of channel straightening projects (Reason 5), or suppress natural rates of change, such as through river bank or coastal protection works (Reason 7). In recognition of the widespread influence of human activities on the Earth’s surface, the term ‘Anthropocene’ has been proposed as a new geological time interval. Have human activities become the dominant influence on the shaping of the Earth’s surface, and if so, will these activities leave an imprint in the long-term, future geological record? In Wales, as elsewhere, vigorous debate surrounds the merits of this proposed new time interval, in part because it is not easy to assess the relative importance of natural extreme events (e.g. earthquakes or rare floods – Reason 2 and Reason 4), internal landform adjustments (Reason 5), and human activities as influences on landform/landscape development and the long-term geological record. Natural extreme events, for instance, can accomplish rapid geomorphic change, perhaps undoing many decades of human engineering and infrastructural developments, as was seen in the winter 2014/2015 coastal storms and floods that damaged many parts of the Welsh coastline (see forthcoming Reason 9). Nevertheless, there is no doubt that many human activities in Wales – indirectly or directly – involve the movement of mass (rock, sediment and water) at rates that vastly exceed natural rates, and in ways that will persist far into the geological future. This is most visible in the case of mining activities, such as Electric Mountain near Llanberis, Gwynedd, where vast quantities of high-quality slate have been removed to leave a terraced hillside that towers above Dinorwic Power Station (upper photo: Denis Egan – www.flickr.com/photos/theancientbrit/288064095/, reproduced under Creative Commons licence). Other spectacular examples include the copper mines on Parys Mountain, Anglesey, or the open cast coal mines of the south Wales valleys. 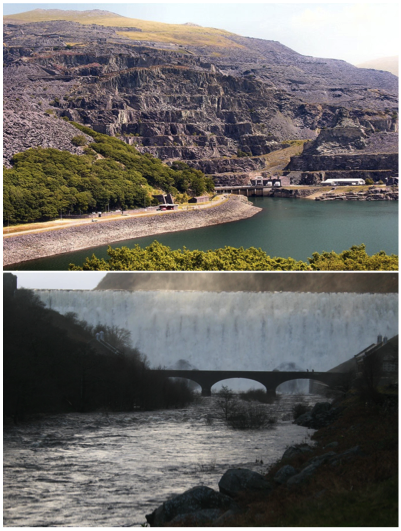 Other highly visible human impacts on natural hydrological and sedimentary cycles occur as a result of activities such as dam building, reservoir construction and inter-basin water transfer schemes, as exemplified in the Elan valley, Powys (lower photo: Stephen Tooth), while many coastal areas have been affected by estuary dredging, beach replenishment, and coastal dune landscaping (see ‘Did You Know?’ below). Other indirect and direct human activities are far less visible, but nonetheless may still be impacting on geomorphological processes, landforms and landscapes across Wales. For instance, along many parts of the Welsh coastline, a variety of human-made materials such as glass, house bricks, ceramics, metals and plastics now form a small, but perceptible and still growing, component of beach sediments. The long-term significance of these materials, both geomorphologically and in wider environmental terms, is open to debate. Glass ‘pebbles’ recovered from South Beach in Aberystwyth, Ceredigion (upper photo), are relatively benign, as glass is made primarily from commonly-occurring natural elements (mainly silica, sodium carbonate and calcium carbonate). Although persisting in sediments, glass will undergo rapid physical break down under the influence of high-energy or extreme wave and swash conditions. 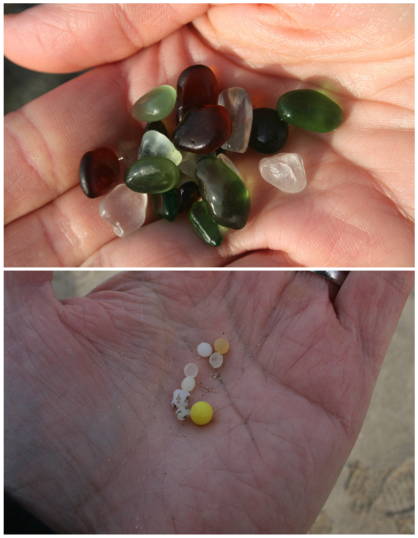 By contrast, many plastics, such as the beads recovered from Whitesands beach, Pembrokeshire (lower photo), are human-made polymers derived from petrochemicals (hydrocarbons). Some plastics will persist in sediments but also may represent a more insidious problem, as it is thought that their physical and chemical break down may facilitate ingestion by marine organisms. In Wales and farther afield, this is leading to fears that plastics are entering the food chain, with as yet poorly understood implications for human health (Photos: Stephen Tooth). Did You Know? Kenfig National Nature Reserve in Glamorgan is one of the last remnants of a large 3300 ha (33 km2) dune system that once stretched more-or-less continuously along part of the south Wales coastline from the Gower Peninsula in the west to the River Ogmore in the east. Over the last century, however, many of these coastal dunes have been lost to urban, industrial and recreational developments, including caravan parks and golf courses, while others have become overgrown and stabilised by vegetation such as marram grass (Ammophila arenaria). Some estimates suggest that over the last 50 years, 64% of areas of open, mobile sand dunes have been lost from the Welsh coastline as a whole, eliminating the conditions necessary for a variety of rare plants and insects to flourish. These include the threatened fen orchid (Liparis loeslelii), marsh helleborine (Epipactis palustris), the vernal bee (Colletes cunicularius) and the dune tiger beetle (Cicindela maritime). Loss of mobile dunes has occurred even in protected sites such as Kenfig, so in recent years, heavy vehicles have been shifting tons of sand at the site to recreate ‘natural’ dune blowouts and slacks, which are characterised by regular wind disturbance and more mobile, open sand surfaces (http://www.bbc.co.uk/nature/17339061). Given Kenfig’s protected status, creating new habitat from the deliberate loss of some existing habitat might raise some eyebrows, but the policy has been deemed ‘destructively constructive’; in other words, a necessary risk to provide the habitat essential for ensuring the survival of rare species. From this example, the influence of human activities on Welsh landscape dynamics can be seen clearly, and both now and in the future, such deliberate earth moving is likely to form an increasingly important part of much environmental management. Posted on October 29, 2015 by stephentooth. This entry was posted in 10 Reasons Why .... 10 Rheswm Pam .... and tagged Anthropocene, extreme events, geomorphology, landscape change. Bookmark the permalink.